Willie and Merle most famously paired up when they released the album Pancho & Lefty in 1983. The title track written by Townes Van Zandt became a #1 hit, and so did the album. The duo released another album together in 1987 called Seashores of Old Mexico, and were joined by Ray Price for the 2007 album Last of the Breed. The title Django & Jimmie refers to Willie Nelson’s Belgium-born and French-residing guitar playing muse Django Reinhardt, and Merle Haggard’s hero of Jimmie Rodgers. 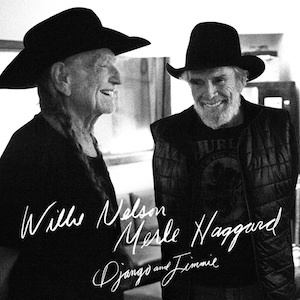 Willie says the tone of his famous guitar Trigger was inspired by Django, and Willie has recorded Django’s “Nuages” many times throughout his career, including on his last album December Day. Haggard famously released a Jimmie Rodgers tribute Same Train, A Different Time in 1969. But the lead single from the album sounds like it was inspired by something much different than Django or Jimmie. Willie sang a few verses of “It’s All Going To Pot” to Jimmy Kimmel, and told the crowd it will be released appropriately on 4/20. READ: Is Willie Nelson Becoming a Pot Punchline? 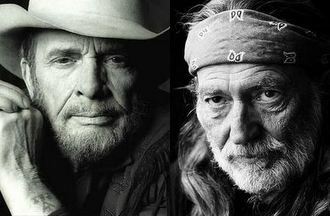 Since 2011 and before, an album has been rumored to be in the works involving Willie Nelson, Merle Haggard, and Kris Kristofferson in a project called The Musketeers. Merle first made reference to it in early 2011, and then all three of the men acknowledged the project before the Grammy Awards in 2014 where they performed together with Blake Shelton. It was also revealed around the time that Kris Kristofferson was beginning to experience memory issues. Willie & Merle are also getting set to play a series of three sold out shows at the Whitewater Amphitheater in New Braunfels, TX on March 26th, 27th, and 28th. The release date for Django & Jimmie is June 2nd. The pot jokes were funny the first thousand times, Willie. Still pumped for this album. I’d guess the Jimmie is for Jimmie Rodgers. The problem was is it was not presented as “Jimmie.” It was presented as “Jimmy” in all the copy having to do with Willie’s appearance on Jimmy Kimmel Live, which I guess is not surprising since the source was “Jimmy” Kimmel. Now that the proper spelling has been discovered (at least here, it still appears as “Jimmy” pretty much everywhere else at the moment), then this can be linked with another interview Merle Haggard did in January (lined above) to confirm that the name of the album is indeed “Django & Jimmie,” and that “Jimmie” is indeed Jimmie Rodgers. The story has been updated with this information. Well, back in the “Pancho and Lefty” days, they were spelling it “Poncho”–on the actual albums. Thats what the article said anyway. it is “Django and Jimmie” as in Django Reinhardt and Jimmie Rodgers”¦..I know the songwriters who wrote it. They corrected it! People do pay attention to me…even if I did misspell Rodgers…been a long day. Can’t wait to hear the album. If this comes anywhere close to Willie’s ‘ Band Of Brothers record it should be a killer There was some inspired writing by Willie on that collection . Add Merle’s writing gifts his legendary vocals and the observations of these two icons and damn … -this thing could be almost as good as Sam Hunt or the Kruise Kids . Interestingly, Jerry Jeff named his son Django after Mr. Rheinhardt. I accept Willie’s passion for getting blown away, and I am crazy about Willie, but I hope that people who are impressionable think before they embark on a lifestyle of becoming a stoner. I have a similar disdain for the promotion of excessive drinking, which is far more pervasive in country music. I am pro-legalization of marijuana and some other recreational drugs, even though I don’t think that using them (or getting drunk) is very bright. Sounds like a great CD, and I will be sure to pick it up. love these guys, will definitely buy this album, but one thing that gets chocolate all up in my peanut butter is that there have already been duet albums from these guys. can’t they do duets with less predictable partners, a la Tony Bennet/Lady Gaga? I would love to hear an album from Willie and Dolly or Willie and Marty before another one with Hag. Actually, a Willie and Tony duet album sounds like it could be a good one—maybe if they had done it 25 years ago. Or even in the late ’90s. Not so sure about now! People comment that Willie is hard to sing with–do they not? I know Dolly did, and it seems I have read that elsewhere. His unique phrasing can be challenging, I bet. But, in spite of (because of?) that, he sure has some great duets out there! My wife must love him–she has a Willie tattoo, I think. How do you not know if your wife has a tattoo? I think Charlie probably means he THINKS its a tattoo of Willie and not the milk man or …….??? hmmmm..? great idea Albert! If I look like Willie Nelson then nobody will ever catch me!!! How hard can he be to sing with. He must have sung with more different artists over more years than any other artist in history. Among country singers, only George Jones may be in that ballpark, but I don’t think it’s even close. Last time I saw Merle in concert, before playing Pancho and Lefty he said “This is from an album I did with the great Willie Nelson. We might do another one if we live long enough.” Looks like he wasn’t kidding. I really wish Willie would stop with the constant pot stuff. He’s become a caricature of himself in that regard. Hey, the guy’s 81. He’s been singing his songs for 60 years and has recorded them every way you can possibly record them. And he’s outlived all the drinkers he used to hang with. If he wants to be a walking advertisement and testament for the virtues of marijuana use, that’s his business. And it’s fine with me. And I’m not a pot smoker/user. i’d like to see Mr. Nelson be a little more pro active about marijuana’s medical benefits. soldiers with ptsd, little kids with life debilitating seizures…along those lines. other then that, Willie can say whatever the hell he wants. im lookin forward to this record. As Albert mentioned, the recent ‘Band of Brothers’ record was top notch (Willie is always top notch when he is actually motivated to write), and Haggard has also been on a late career roll with his last couple of albums. Though their voices have both deteriorated quite a bit with age and experience, I believe both of these guys are still capable of brilliance, and by working together, I think they have insured the fact that we are in for a treat. But of course, that’s not the Willie way. Actually, the guy who shows Willie the most respect is Letterman. He treats him like the living legend that he is. I don’t think he even mentioned weed or the IRS last time Willie was on Late Night – just asked him questions about his music and songwriting. Not a fan of Letterman really, but as mentioned before his Willie interviews are pretty damn good. This album is going to be great. I loved the duet they did on Heroes Album. I know you have people sending you links and crap all the time, but did you ever see the comments Haggard made about Sturgill not too long ago? He gave him the Hag stamp of approval. YAY! Merle and Willie’s new collaboration cd. Is this going to be pressed on vinyl? I’d love to get a copy of it!